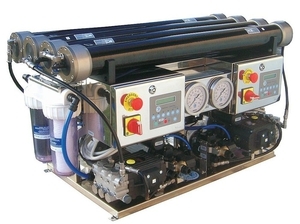 Energy Recovery Watermaker, equipped with Osmosea® Pressure Intensifier. Simple, Essential and Cheap. Direct power supply from batteries, easy installation, compact size and without electronics. The boat water maker is used for on-board production of fresh water from seawater. Each type of water maker uses different technology, including reverse osmosis, distillation and evaporation. Choice will depend primarily on the water maker's capacity with respect to on-board water needs. Size and power consumption are other important factors, since both vary directly with output capacity.